Chinese New Year dim sum with a few of our Asian dental school classmates! We had a plethora of delicious Chinese food and I got to put my VERY limited grasp of Cantonese to good use. We ventured out here at the end of January for DineLA - a three course meal for $35. The restaurant is also conveniently situated inside LACMA, so of course we had to take a few gratuitous LACMA lamp post pictures! Came here with my childhood/high school best friend, who was visiting from New York. It's located in a really quaint/interesting/lovely area of town situated between The Grove and The Beverly Center. The food is awesome but pricey - a single lobster roll costs $7 and a plate of uni with burrata (3 slices) will cost you $18. Random spontaneous nighttime Westwood invasion! We hit up all the classic places - In n Out and Diddy Riese - then meandered around Westwood for a little bit. It's kind of nice to be able to walk on the streets at the night without the fear of getting mugged. Tried out this restaurant before watching Wicked at the Segerstrom Center in Costa Mesa. 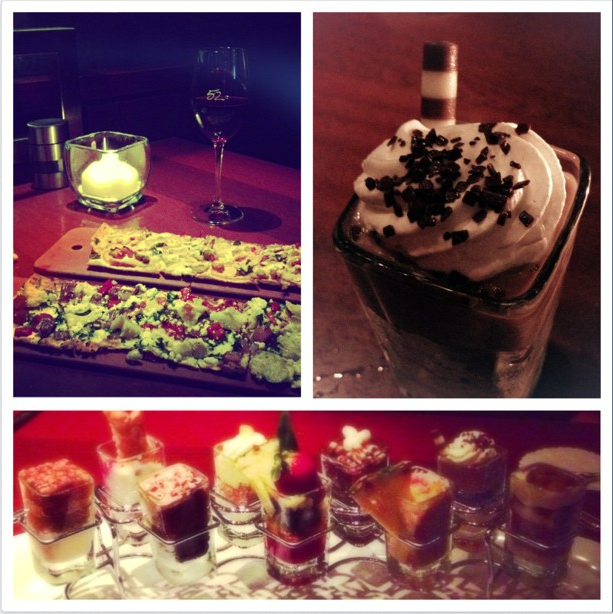 Good wine selection, appetizing flatbread, and an irresistible selection of dessert shots. Right across the street from campus, this place is our default "post-exam" or "post-morphology lab" drinking venue. They have happy hour everyday from 3-6pm along with an amazing spinach-artichoke dip with pita bread. One of my all-time favorite boba places in Southern California. I came here randomly on a Sunday afternoon and still waited about 25 minutes to place my order. The line was out the door and around the corner! Still, it's worth the 10-15 minute drive from my apartment in Los Angeles because there are simply NO quality boba shops around USC. My favorite boba place close to my apartment in Downtown Los Angeles. It's located in Little Tokyo, which is an amazing place to explore and get good Japanese food.